I admit that I’ve had my doubts about Assassin’s Creed III in the three months since I had last played it. I had my doubts that the game, buggy and rough-edged as it was, deserved the very positive review I gave it last October. I had my doubts when my colleagues Luke and Kirk, representing the other point of view on 2012's most divisive game (sorry, Mass Effect 3! ), argued strongly to me that the game had massive problems. This past weekend, I tried playing Assassin’s Creed III again. I had a bad cold and was more or less confined to my couch. I was tiring of Dead Space 3's bleakness and grabbed my copy of ACIII. I figured I would knock off a few sidequests, probably do more of the game’s acclaimed naval missions and find out if this game held up—or if it was a game I was so excited to review that I had misjudged it. I had played the game for 20 hours last October, tying off the game’s main quest. This weekend, I went in for nine hours. Once you have finished the main storyline in Assassin’s Creed III you can only play as Connor, the game’s prickly half-British, half-Mohawk assassin protagonist. In the main game he is hard to like. He’s led around by the nose early on and butts heads with many characters late. He is not the charmer that his series predecessor Ezio was. Ezio was a swashbuckler. Connor is a grouch. His voice actor is largely passionless, which doesn’t help, but Connor’s village was burned down when he was a kid and by the end of the game, he’s discovering that it was his pal George Washington who was responsible. His attitude and his discomfort with nearly everyone in the game’s main story feels justified. He’s a man without a family and with nearly no one to trust. By failing to tether much of its best content to the game’s main quest, the creators of ACIII enabled their players to miss a lot of good stuff. Connor comes off as a much more likable and interesting character if you play as him for nine more hours after the main storyline is done. In those nine hours, you (or I, since this is what I did this past weekend) mostly play through what are technically sidequests. Just about all of them are available earlier in the game. It’s just human nature to succumb to the momentum of the game’s main story and ignore them. If you don’t ignore them or if you play them as I did you discover a more confident Connor who suddenly feels like one of gaming’s greatest super-heroes, a sort of working class icon who defends the poor against blight and bad guys. I returned to the game in its version of 18th century lower Manhattan. I checked the game’s map and spotted a “W”. That represented where George Washington was hanging out. As Connor, I ran to him and triggered a conversation. Connor more or less chewed Washington out. Washington defended himself, resigned himself to a possible retirement. Connor scolded him for shirking responsibility, implying that it might be to Connor’s credit that Washington would become President. Washington talked about creating a lawn where he could go bowling and then—this was a surprise!—he and Connor engaged in a match of bocce or lawn-bowling or something. It was ridiculous. It was a new mini-game. It was a wink from the developers that we can’t take the game’s version of history that seriously. It was perfectly representative of a game and a series that seems to exclude nothing. Just when you think you’ve found everything there is to do in an Assassin’s Creed game, they throw in some bowling-with-George-Washington at you. After the bowling I got to side-questing. And this is when the other part of Connor’s personality came to the fore. The game’s versions of Boston and New York are split into three zones. At the start, each zone is under the bad guys’ control, but by doing small mission in each zone, Connor can liberate them. This leads to Connor being able to recruit a citizen of each zone to join his pack of assassins, which then grants Connor access to these men and women as sort of smart-bomb power-ups during any fight in the game. That’s how the system works, but what the game’s fiction shows is a Connor who exhibits an admirable sense of charity. The lower-Manhattan zone is full of burned buildings and people at risk from smallpox. In this zone, you need to find pox-infected blankets to burn and sick, threatening dogs to kill. You carry sick people to doctors. You can do all this while en route to other quests, but as you’re doing them you develop the rare sense that Connor is doing something simple and good. So many of the heroic actions we commit in video games are overly grand. They involve saving the world. In northern New York, you wind up helping farmers by repelling hooligans while they plant their crops. You pay off or beat up shady government officials who are trying to foreclose on people’s homes. In Boston, you do more traditionally video-gamey things: you attack British prison guards and officials. But in New York, you might as well be Robin Hood or some sort of super-powered soup kitchen volunteer. You do good. Connor feels like a hero for the 99%. During the first 20 hours I played of the game, I made a token effort to build up Connor’s homestead. This region is at the edge of the game’s vast frontier. There, he can recruit woodworkers, lumberjacks and hunters to set up camp. You can observe these salt-of-the-earth settlers building chairs, roasting food and even “record” those actions to build up an Almanac of the Common Man. During my nine hour return, I did much more of this. I recruited a seamstress, a priest, a miner and a pair of innkeepers to the homestead. Each constructed a home there, filling out the homestead’s map. And then the quests started pouring in. The woodworker needed help retrieving his tools in Boston. The innkeeper needed money to build the inn. The hunter needed help chasing an animal and hatched a plan for Connor to chase it out of a mine so she could shoot it dead. The miner developed a crush on the hunter and asked Connor for help finding some flowers for her, and when she rejected the flowers, Connor needed to spy on her to find out what kind of gift she’d prefer. The farmers needed a doctor and, with Connor nearby experienced the birth of their child. All of this was interactive. All of it felt unusually sweet. My Connor felt more and more like a good man, a man people could be friends with. I warmed to him. My Connor felt more and more like a good man, a man people could be friends with. I warmed to him. Many of the little missions I’ve described are simple to play. Blanket-burning is a button-press. Flower-fetching is a climb and a button-press. But the game buried wonderful gameplay surprises in its sidequests. A mission to retrieve something from a cave, for example, turns into a race and swim through a collapsing cavern that is being rocked by an earthquake. A mission to settle a fight turns into an odd little mini-game involving separating two people from punching each other out. Back in New York, I had Connor venture into the underground, which is one of the game’s two vast labyrinths. Connor explores the underground with a lantern and, ostensibly, the game here is that you’re looking for exits in the labyrinth that lead to fast-travel exits. Once found, these fast-travel points can be used to warp from place to place in the game’s big cities. But even these labyrinths hide a surprising amount of interesting gameplay. At first, the New York labyrinth feels like a series of identical passages that you can only effectively navigate by staring at your slowly-filling mini-map. But as you venture ever further you’ll discover small climbing challenges: a pair of towering waterfalls that spill at alternating times and require you to bounce from one briefly-dry wall to another; a system of primitive elevators that needs sorting out; a rocky cavern that requires some Uncharted-esque maneuvering. 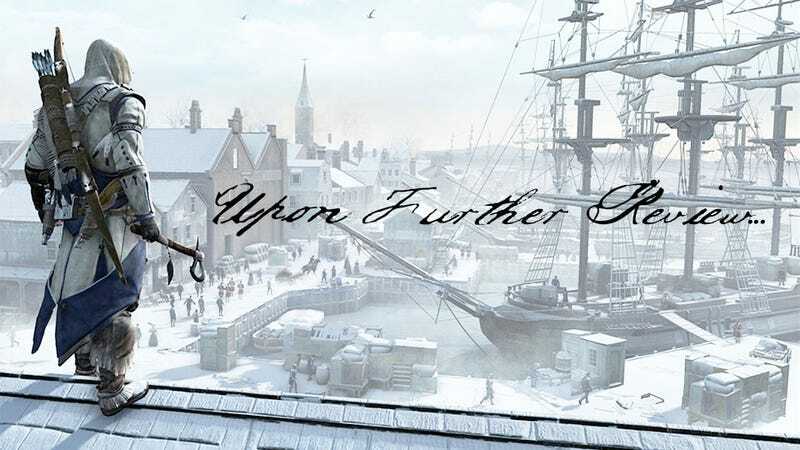 As I plumbed into the game’s many sidequests, I felt reassured that one of my instincts about Assassin’s Creed III was being proven true, repeatedly. The game’s side-content is packed with quality. It’s not just that these sidequests sometimes hide extra, pleasantly-interactive sequences. It’s that they also house a shocking amount of strong linear content. To put it another way, there is a lot of conversation in the sidequests, a lot of characters talking and saying interesting things. Achilles, the guy who used to own the homestead, slowly but surely reveals the region’s history. The recruitable assassins in New York and Boston tell tales about their families and their struggles the more you visit them. The more you play, the richer the world feels. The more I poked at ACIII, the more good stuff I found. ACIII would have been better received if it worked better. The game wasn’t just full of bugs but it failed to redeem the series’ rep for having awkward controls. The bugs, even after patching, are abundant enough to remain a thing worth mentioning. At one moment during my nine-hour return, I saw it rain inside. A quest to hunt a bear kept failing because a dead body that was supposed to spawn near a cave wasn’t appearing. I reloaded the game and it finally did. The controls are another story. Horse controls still stink, but the climbing and combat controls prove to be better the more you’re used to them. And they way you get used to them, it turns out, is by playing sidequests. A bunch of “brawler” sidequests, for example, lead you to fistfights with increasingly-tough bare knuckle fighters. You travel from Boston to New York to the frontier to fight these guys. By the time you meet the “rope beater” in Boston, you’ve learned how to effectively block, counter, grab and throw. The game’s main questline has a mission that tries to teach you these things, but in the main quest such lessons are awkwardly wedged into the narrative the game’s creators want to tell. Gamers learn better through repetition. The brawler quests therefore teach combat better. The hunter quests do the same for hunting and also pull the player into regions they might never otherwise discover. In the first 20 hours I played of the game, I never encountered a bear. Following the hunter quests, I found a region filled with bears and spent an interesting 20 minutes fighting them. The more I poked at ACIII, the more good stuff I found. The frontiersmen missions, for example, led me to quests that had me chasing down the headless horseman and investigating ghost and sea monster sightings. Once I pickpocketed enough people, I was given some thieves’ tasks to complete. Finishing the storyline enabled the player to start placing nodes on the game’s map to triangulate the location of hidden “pivots”. As I tracked those things down I earned cheats. I’ve activated one that causes lightning to crack and thunder to clap every time I defeat an enemy. As I recruited assassins and sent them up and down the eastern seaboard to free colonies from Templar control, I earned an extraordinary number of support abilities. My posse of assassins can now snipe distant enemies, set ambushes or even just surround me and be my bodyguards. One of the game’s lingering problems is that most of its sidequests and sub-systems can easily remain hidden. You could finish the game and miss the underground or ignore the homestead. You might as well ignore the trading system, which I still haven’t found a use for. By failing to tether much of its best content to the game’s main quest, the creators of ACIII enabled their players to miss a lot of good stuff. Some good content was simply chopped out for what seems like marketing reasons. For example, the final mission of the 45 minutes worth of temporarily-PS3-exclusive Benedict Arnold missions presents one of the biggest battles in the game. For players who wanted more large-scale combat in the game and didn’t play the PS3 version of the game, that’s a pity. I’m now 29 hours into Assassin’s Creed III. Yes, I still like it quite a lot. Yes, I recognize it as a bulky, uneven game that should have been more polished and does itself few favors by hiding much of what’s best about it. A return visit to the game might change your opinion of what Ubisoft made or at least of their star character. Playing just the sidequests turns the game into more of a playground of climbing, helping and killing. It’s still historical tourism, in a way, but you’re no longer witnessing the occasional awkwardness of making cameos in famous historical events. I’m still feeling mostly good about the game, and I haven’t even gotten back to the naval missions yet. I’m happier than ever with ACIII. But please understand: I was also on a lot of cold medicine this weekend. Try the game (again) yourself.